1 A None No Power Seat 1 A is an Economy Class Bulkhead seat that has extra legroom due to the bulkhead since there is a small cutout in the wall. However, the close proximity to the lavatory and galley may be bothersome. The tray table is in the armrest, making armrests immovable and slightly reducing seat width. There is no floor storage for this seat during takeoff and landing. 1 B None No Power Seat 1 B is an Economy Class Bulkhead seat that has extra legroom due to the bulkhead since there is a small cutout in the wall. However, the close proximity to the lavatory and galley may be bothersome. The tray table is in the armrest, making armrests immovable and slightly reducing seat width. There is no floor storage for this seat during takeoff and landing. 1 C None No Power Seat 1 C is an Economy Class Bulkhead seat that has extra legroom due to the bulkhead since there is a small cutout in the wall. However, the close proximity to the lavatory and galley may be bothersome. The tray table is in the armrest, making armrests immovable and slightly reducing seat width. There is no floor storage for this seat during takeoff and landing. 1 D None No Power Seat 1 D is an Economy Class Bulkhead seat that has extra legroom due to the bulkhead since there is a small cutout in the wall. However, the close proximity to the lavatory and galley may be bothersome. The tray table is in the armrest, making armrests immovable and slightly reducing seat width. There is no floor storage for this seat during takeoff and landing. 1 E None No Power Seat 1 E is an Economy Class Bulkhead seat that has extra legroom due to the bulkhead since there is a small cutout in the wall. However, the close proximity to the lavatory and galley may be bothersome. The tray table is in the armrest, making armrests immovable and slightly reducing seat width. There is no floor storage for this seat during takeoff and landing. 1 F None No Power Seat 1 F is an Economy Class Bulkhead seat that has extra legroom due to the bulkhead since there is a small cutout in the wall. However, the close proximity to the lavatory and galley may be bothersome. The tray table is in the armrest, making armrests immovable and slightly reducing seat width. There is no floor storage for this seat during takeoff and landing. 11 A None No Power Seat 11 A is an Economy Class seat that does not recline due to the Exit Row behind. 11 B None No Power Seat 11 B is an Economy Class seat that does not recline due to the Exit Row behind. 11 C None No Power Seat 11 C is an Economy Class seat that does not recline due to the Exit Row behind. 11 D None No Power Seat 11 D is an Economy Class seat that does not recline due to the Exit Row behind. 11 E None No Power Seat 11 E is an Economy Class seat that does not recline due to the Exit Row behind. 11 F None No Power Seat 11 F is an Economy Class seat that does not recline due to the Exit Row behind. 12 A None No Power Seat 12 A is an Economy Class Exit Row seat that has extra legroom. However, it may also have limited recline due to the Exit Row behind. The tray table is in the armrest, making armrests immovable and slightly reducing seat width. There is no floor storage for this seat during takeoff and landing. 12 B None No Power Seat 12 B is an Economy Class Exit Row seat that has extra legroom. However, it may also have limited recline due to the Exit Row behind. The tray table is in the armrest, making armrests immovable and slightly reducing seat width. There is no floor storage for this seat during takeoff and landing. 12 C None No Power Seat 12 C is an Economy Class Exit Row seat that has extra legroom. However, it may also have limited recline due to the Exit Row behind. The tray table is in the armrest, making armrests immovable and slightly reducing seat width. There is no floor storage for this seat during takeoff and landing. 12 D None No Power Seat 12 D is an Economy Class Exit Row seat that has extra legroom. However, it may also have limited recline due to the Exit Row behind. The tray table is in the armrest, making armrests immovable and slightly reducing seat width. There is no floor storage for this seat during takeoff and landing. 12 E None No Power Seat 12 E is an Economy Class Exit Row seat that has extra legroom. However, it may also have limited recline due to the Exit Row behind. The tray table is in the armrest, making armrests immovable and slightly reducing seat width. There is no floor storage for this seat during takeoff and landing. 12 F None No Power Seat 12 F is an Economy Class Exit Row seat that has extra legroom. However, it may also have limited recline due to the Exit Row behind. The tray table is in the armrest, making armrests immovable and slightly reducing seat width. There is no floor storage for this seat during takeoff and landing. 13 A None No Power Seat 13 A is an Economy Class Exit Row seat that has extra legroom. The tray table is in the armrest, making armrests immovable and slightly reducing seat width. There is no floor storage for this seat during takeoff and landing. 13 B None No Power Seat 13 B is an Economy Class Exit Row seat that has extra legroom. The tray table is in the armrest, making armrests immovable and slightly reducing seat width. There is no floor storage for this seat during takeoff and landing. 13 C None No Power Seat 13 C is an Economy Class Exit Row seat that has extra legroom. The tray table is in the armrest, making armrests immovable and slightly reducing seat width. There is no floor storage for this seat during takeoff and landing. 13 D None No Power Seat 13 D is an Economy Class Exit Row seat that has extra legroom. The tray table is in the armrest, making armrests immovable and slightly reducing seat width. There is no floor storage for this seat during takeoff and landing. 13 E None No Power Seat 13 E is an Economy Class Exit Row seat that has extra legroom. The tray table is in the armrest, making armrests immovable and slightly reducing seat width. There is no floor storage for this seat during takeoff and landing. 13 F None No Power Seat 13 F is an Economy Class Exit Row seat that has extra legroom. The tray table is in the armrest, making armrests immovable and slightly reducing seat width. There is no floor storage for this seat during takeoff and landing. 28 C None No Power Seat 28 C is an Economy Class seat, however, the close proximity to the lavatories may be bothersome. 28 D None No Power Seat 28 D is an Economy Class seat, however, the close proximity to the lavatories may be bothersome. 29 A None No Power Seat 29 A is an Economy Class seat in the last row of the plane and may have limited recline. The close proximity to the lavatories may be bothersome. 29 B None No Power Seat 29 B is an Economy Class seat in the last row of the plane and may have limited recline. The close proximity to the lavatories may be bothersome. 29 C None No Power Seat 29 C is an Economy Class seat in the last row of the plane and may have limited recline. The close proximity to the lavatories may be bothersome. 29 D None No Power Seat 29 D is an Economy Class seat in the last row of the plane and may have limited recline. The close proximity to the lavatories may be bothersome. 29 E None No Power Seat 29 E is an Economy Class seat in the last row of the plane and may have limited recline. The close proximity to the lavatories may be bothersome. 29 F None No Power Seat 29 F is an Economy Class seat in the last row of the plane and may have limited recline. The close proximity to the lavatories may be bothersome. Aer Lingus offers a variety of food options for purchase. Beverage service is complimentary. 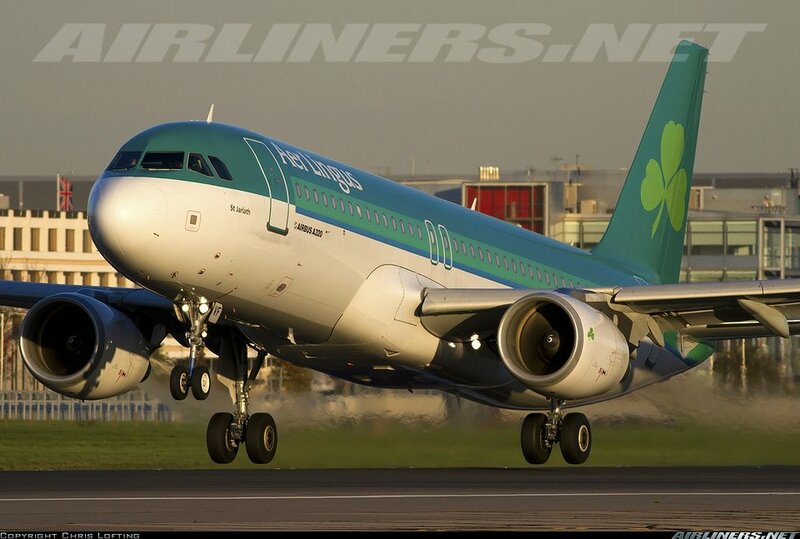 On Airbus A320 flights, Aer Lingus offers the Sky Cafe service - hot beverages, muffins, biscuits, smoothies, soft drinks, spirits, beer, and many more items. The A320 operates in a one-class configuration of 174 Economy Class seats. Regular economy seat, the window is in-line with the seat but the view is obscured by the wing. This is an OK seat with a well placed window from which you can see the engine and wing without them blocking your view. This was just a short flight from DUB to MAN following a trans Atlantic flight. Air Lingus boarded priority first then "all remaining guests" so stand by the gate to get on the plane first especially on a rainy day as no airbridge is used at DUB or MAN and you board/disembark by stairs. No IFE but that is expected for short haul. It was comfy and my 6'3" frame had enough room for the 52-minute hop from LHR to DUB. 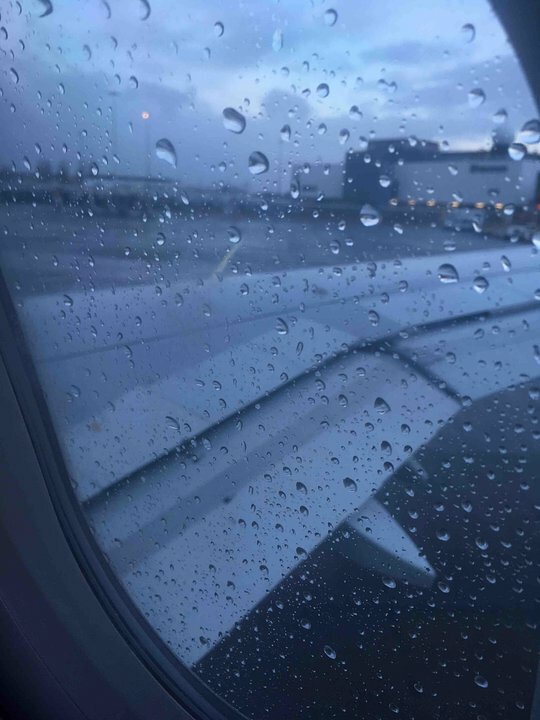 I took this plane on a flight from Dublin to Amsterdam. The flight was delayed like all flights into Amsterdam and I was randomly assigned to the last seat. Flight attendants gave me an upgrade to a empty road toward the middle of the plane, and let let me use one of there phones to let my mother in America know the flight was delayed 1 hour after I tried getting the gates wifi on the plain. Thanks Aer Lingus for the great service . This is one of the worst flights I've ever had. Having done a good deal of business and leisure travel, that's saying a lot. No entertainment, no charging, nothing. Just incredibly cramped seating where my knees where buried in the seat in front of me. The girl in front of me tried to put her seat back and physically could not do it because there was literally nowhere to put my legs. And for a 3+ hour flight it was especially miserable. Seats in row 12 are more upright by default than other seats, and do not recline at all. The seats were big enough for my 187cm, heavy frame with some space between my knees and the seat in front. The windows in the first few rows are misaligned so this seat gets two, with one directly in line with your shoulder. The entirety of rows 11 and 12 have seats that do not recline at all. Aer Lingus flight was interesting- we were hassled at the gate regarding no overhead bin space even though we were early in the boarding process. Next we were hassled over carry on weight being close to 10 KG. While the flight from DUB,went well, I was happy to have paid extra to be up front versus in the back of the plane. While 6ABC are good seats, everyone is packed into the A-320 pretty tightly. Aer Lingus is low on my list as a low-budget carrier with employees that hassle customers. Best seats in this plane. Huge legroom cause of the exit row. Its totally worth, to pay the few Euro's for this seats!!! Not much dufferent to seat 8A, seat 7A is exceptionally good as it is nesr the front if the Aircraft giving you a decent view of all that is outside, the wing included. My preferred choice for DUB-LHR flights. Board first given that EI usually boards rows 20-29 first in Dublin, window seat for something to lean into, and get a decent view when it takes the path over central London when coming in to land. Good seat with a good view of the engine for plane enthusiasts and also a good view of the ground for when you are flying over land. 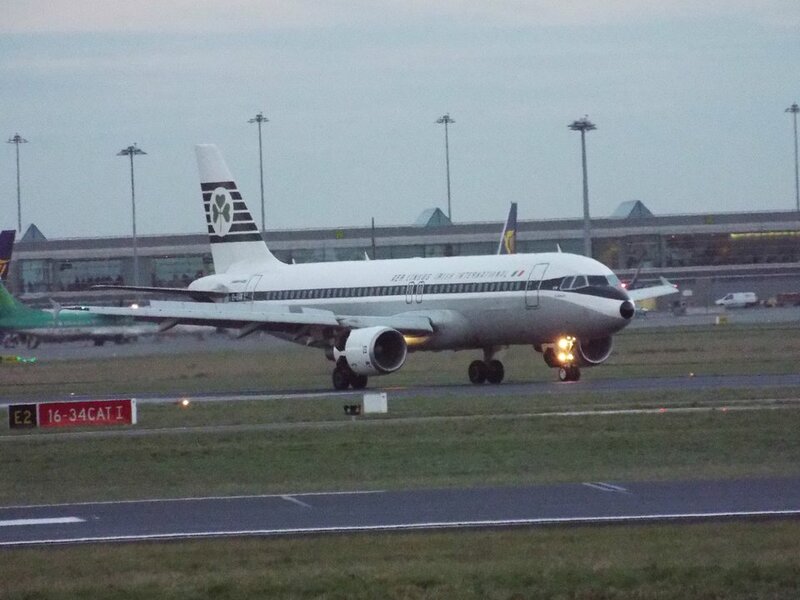 Aer Lingus flies 1 versions of Airbus A320.